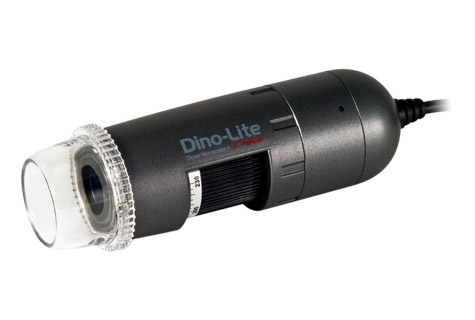 The Dino-Lite AM4112ZT handheld microscope features rotatable polarizer to decrease glare to almost any extent. It is capable to see through some surfaces of partially transparent materials such as jewelry, skin, glass, or plastic. Also it suppresses light reflections from materials such as solder joints and other reflective surfaces. The AM4112ZT can be convenient as it connects directly to a television using analog composite video that can be used in a store front, assembly line, presentation, and more.